If you are reading it today, this means, you haven’t updated your WhatsApp. This feature is similar to SnapChat‘s Story feature, which has been also incorporated in Instagram for mobile. The direct answer to this question is simply upgrade your WhatsApp to the new version, as it has been made public for everyone. So, if don’t have this feature enabled, then navigate straight to Google PlayStore or Apple AppStore. Well WhatsApp Status is a new feature, which allows your keep a Temporary Status display, which stays alive for 24hours only. You can share a Selfie, picture or even a short-time Video along with a Tag line like what’s on your mind. This status is visible to everyone inside your WhatsApp contact list, and you can also check, how many people did see your Status. But wait, that’s not everything, there is a privacy control also available for this feature. Just go your app’s setting screen and dive into Privacy Section, and there’s the option to Control, who’s allowed to see your Status and who’s not. 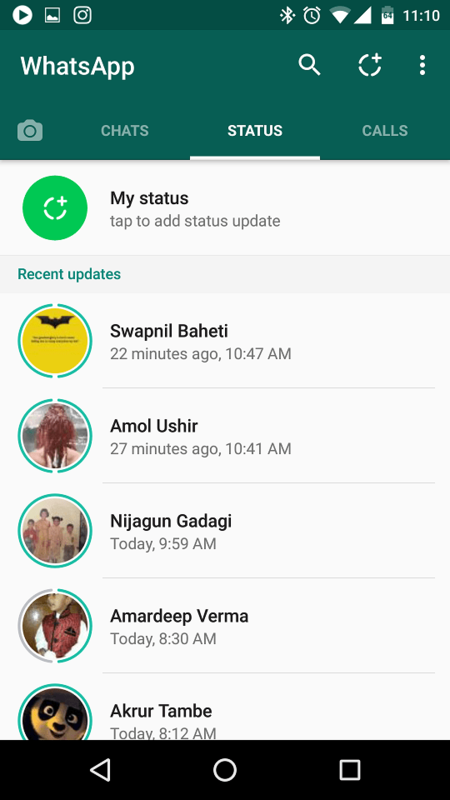 How to use this WhatsApp Status feature? Once updated, you’ll notice a new Tab on your WhatsApp home-screen something like shown in below screenshot. Just tap on the new Tab you see, either the one with Camera icon over it or the other tab labelled Status. The moment you get into Shoot mode of your Status, click whatever you want to share or simply press and hold to click button to record a short video. After you are done, add a Caption line to it and then share. 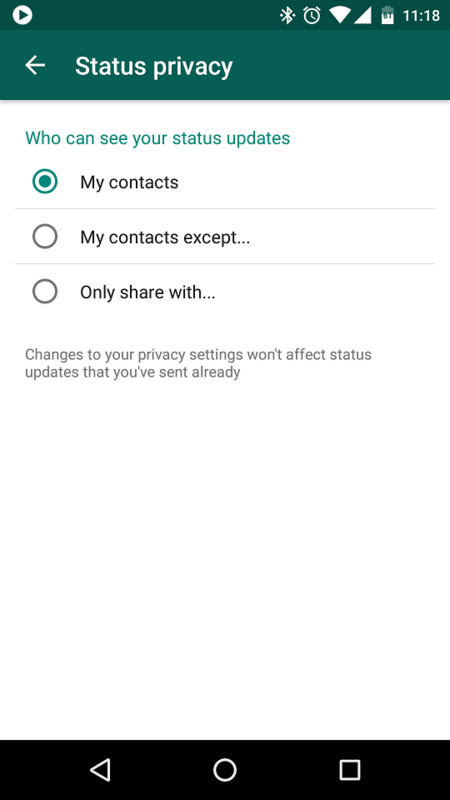 It will be all your allowed contacts, which can be altered from the Status privacy option. Do remember, this WhatsApp Status you set, stays only for the 24 hours, once the time is over, the Status disappears from the Status Tab and you need to set another. One more thing to remember, your default ‘Single Line WhatsApp’ status option does not exist anymore. 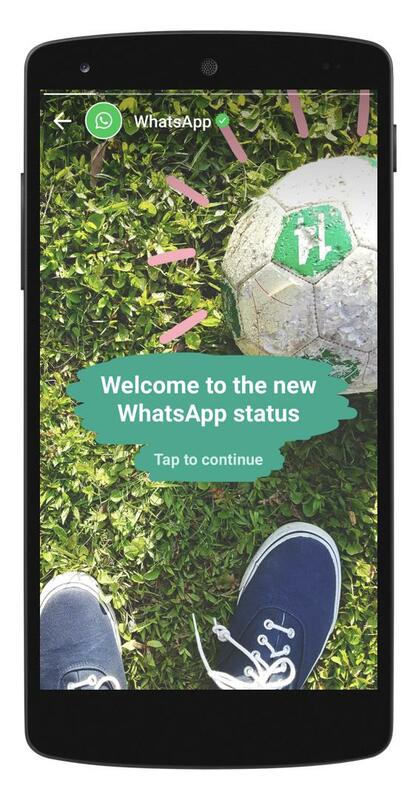 Enjoy your new WhatsApp Status feature and keep reading and sharing.